For the majority of my life I had a negative mindset about money, making money and saving money. But I had no idea how to change it or that it was even wrong. I wanted money, that’s for sure. Money was the cause of most of my stress, but I just couldn’t seem to get a handle on it. I know I wasn’t alone. In fact, America has hit an all time high in credit card debt; around 1 trillion dollars of debt to be exact. How can something we think about so often, something we want so badly have this negative affect on us? The truth is, like most workings of our mind, we just have to change the way we think about it. Finally, I feel like I’m at point where I finally have a healthy money mindset and it is not at all what I imagined it to be. There are steps and understandings I had to take to finally get a grip on my out of control money habits. So let’s talk about creating a healthy money mindset. Where do negative ideas about money come from? 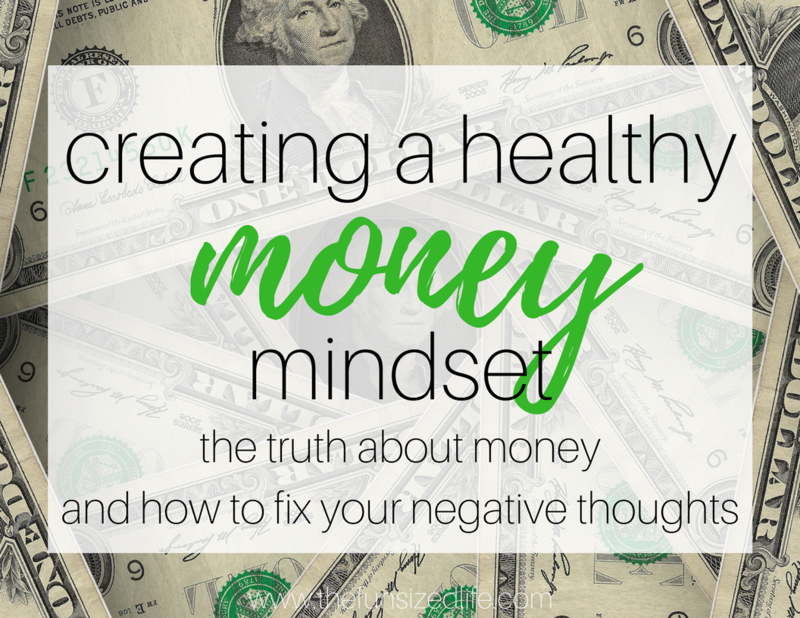 First of all, let’s break it down into the top areas that a negative money mindset begins. When I first heard about some of these, I experienced those big “AHA” moments. Often times things can be so ingrained in us that we don’t think twice about them. These ideas are not meant to offend anyone or say for sure that these are where your personal thoughts may have originated. They are simply common suggestions. Isn’t it so true that when deep down we are envious of a person, we tend to act out by cutting them down? You see someone with a more in-shape physique and you are either quick to tear them down or tear yourself down? This is also a common case with money. You see someone with a brand new car or who put in a new pool and you either wish you had what they have or you judge them for being materialistic. Neither of these are healthy options. Trust me, I’m totally guilty of them and it never got me anywhere. I definitely think I ingrained that phrase into our oldest daughter’s brain, which is why I’m now trying to make up for it by getting her started on healthy money habits at a young age. Now, when we really don’t have the funds for something I try to remind our kids that we do have money, we have plenty, and we are fortunate to have all that we have, we just have more important places to put our money. Then there’s the mindset that those with money must be selfish money hoarders. How can they have so much while the rest of us have so little? They must be selfish. We tell ourselves that we never want to be selfish. I know I personally have dug myself into debt by buying things for other people in attempts to not be selfish. I wanted to give and share and do things for the people I love. But the thing is, racking up credit card debt for others is literally pouring from a totally empty cup…a cup that gets deeper and deeper and harder to fill! Personally, I have more money saved than I ever used to. I talk about it more, I work for it more and yet, I love it a whole lot less. Rather than a love or a constant desire for it (like I used to have.) Every move I make with money is strategic, greed-less and done with wise intentions. You can be a billionaire and not love your money, or be broke as a joke and be totally obsessed with it. Something that never occurred to me before. Positive, honest truths about money. not really expecting to learn anything and within minutes was totally hooked. There were so many things that never occurred to me about money! Travel is a given; I need money for that if I plan on doing it successfully. AKA not hitchhiking. Giving. Well, duh, I need to have money if I plan on giving it right? Lastly happiness and health for me and my children. In this aspect money can provide healthy food and good medical care if we need it. It can also keep us pretty happy if I can go into my future knowing that Tom and I, and our kids will be financially at peace. I’ve been through the money struggle game and I don’t want that for my kids and I don’t want it for me anymore either! Money is a lifeless object with absolutely no mind or thought process. That means you are in charge! Money has no magical powers; it is simply currency that we used to obtain things. Don’t let it run you. You’re the boss. You tell that money where to go, when to go there and how much of it needs to go. You’ve got the power. There is about $1.2 trillion worth of cash floating around the good ‘ol USA these days. About 1% of the population is taking advantage of most of it. If you flip through magazines or watch TV and see how foolishly and selfishly some of these 1% are spending their money then let me tell you…you can take it back! If you have real plans that will add value to the world around you, then it’s time you got smart about your money so you can make it happen! Don’t ever think that there isn’t enough money to make your dreams come true. Even if that just means saving enough for an easy retirement. There is $1.2 trillion…get yours. In case you haven’t heard me say this 8,000 times, then here it is: When an act of giving or kindness is done the serotonin (happy) levels increase in the person who does the good deed. It feels good to share what we’ve got, whether that be money, talents or time. The serotonin levels also increase in the person who is on the receiving end and any person who happens to see the act of kindness take place. The point is, everyone wins when you give. The problem is, it’s hard to give with a happy heart when you are stressed to the max about money. This is why it is crucial to get smart with your money so that you can give freely and happily. Spread the wealth. I used to hoard money like crazy because I felt like I never had enough. Now, I give more freely than ever because I’ve flipped my mindset about it – – and I took smart financial steps in the right direction. How to change your thinking. It’s all good, because there are easy things you can do that will help you change your way of thinking. Start your mind switch by making a list of all the things you want the most out of life. Go ahead and just let it all pour out onto the paper. After you’ve gotten written down all the thing you want the most, take the time to cross some stuff off. Once you get it all out, it becomes easier to cross off the things that just aren’t as important. Once you’ve got your list narrowed down, take the time to number things from 1-10 so you know your top 0 biggest priorities. Now that you have your priorities written down, take a look at your monthly spending and see what things you may be spending money on that don’t align with your priorities. Don’t slack on this step. If your top priority is to get in shape, don’t try to justify $200 worth of new yoga pants that you know you’re only wearing around the house! Personally, I know that when I was putting money into savings, it was painful knowing there was money there that I could easily access and spend. It felt like I was robbing myself. It’s so important to remember that saving money is still for you. Let go of any pull you feel to spend it. A great way to do this is to get a savings account that is separate from your regular bank preferably one that’s tough to get at. Set up automatic transfers and then just steer clear. You are not depriving yourself of spending money. You are building for your future and for the things you really want out of life. When we first moved into our house, there were several big purchases that I didn’t buy. Normally, when we’d moved, I would grab my credit card and go shopping for whatever new things I felt like we needed. This time, I saved, and I waited. For months we didn’t have a TV stand. Our living room looked so empty with the TV attached to the wall and nothing but wires underneath it. We also didn’t have bar stools for our center island in the kitchen. Our kitchen table only had 4 seats, which meant there wasn’t enough for our family of 5. Bar stools would definitely have come in handy. I waited, and saved and when I was finally able to afford those stools, I was happier than I had ever been with any purchase I had ever made. I really felt like I had earned them. The anticipation of getting closer and closer to my goal was a great thrill and a very proud moment. Sinking Funds. Tips for Easy Saving. Like I said, money can conquer anyone who lets it. It doesn’t matter how much money you have. There are those who hoard their money, who don’t share it with anyone and use it only for their own personal gain. That’s no way to live your life or spend your money. Abundance is a far different thing. Abundance is a cup that overflows and spills into the lives of other people. So as you start to save, be sure to keep your heart and intentions in the right place. Be patient with yourself. Keep your priorities in mind. Remember you will have set backs, you’ll make mistakes, but if you can stick with smart money choices, you will absolutely be glad that you did. Great article! Money is definitely made to be shared and it’s all about perspective. ? It’s so true that your upbringing can influence your spending habits. We were so poor when I was growing up that I am often guilty of getting my kids too many “things” as a way to compensate! Not good! It’s tough to learn from our pasts. I was guilty of the “eh…just put it on a credit card” mindset. Debt was just a common topic in our house. First we always seem to want to keep up with our friends. Eat out way to much. Tracking spending on little things like that cup of coffee or soda you have to purchase twice a day. All adds up. I have definitely been there. It’s sill how those small things can take away so much of the things we REALLY want! We try and be money positive in our house. Instead of saying we can’t afford that we come up with a saving plan. We especially love to include the kids so they can learn while they are young. Money management is such an important skill. So important to include them…the earlier the better! Exactly. I’m so thankful to have really learned delayed gratification! That makes sense. I spent so much time wanting what everyone else had. I wanted the stuff but I didn’t want the discipline behind managing the money needed. Now after getting smarter with the money I want the stuff less! These are so great! A good money mindset is definitely a must have! Saving a few of these resources for later. It really has totally transformed my life@ Thanks Jessie! Money is such an emotional taboo topic! People need to have more conversations about what to do with money as far as investing, Saving and money management in general! Great post! I really appreciate the shift in perspective from “not having enough money for that” to, “choosing to spend money on something else” at the time. What an important distinction! Thank you for these great tips. I’m glad you like it Joi. Thank you. I love changing “we don’t have enough money for that” to “we have more important things to spend money on.” My daughter is still a baby, but I’m going to keep that in mind as she gets older. Great post! It has really helped with our younger ones verses our older one. We tell them what we are choosing to spend our money on and how it’s more important than whatever little thing we may be wanting at the time. Super in-depth article. Very insightful and I loved how you broke it down. I will be making that list and sorting out my feelings about money. Great read! Thanks so much Nadine! Good luck. This is a great article and you are so right on many points, unless we change our mindset about money it will always be a source of too much stress. thanks for sharing. I have found a mindset change can basically change anything in life! Great post. Money is definitely a tricky subject for people to talk about or understand. I don’t mind saving, I just wish I had more money TO save. One day though! It’s all about small steps! Keep it up, you got this! It’s so rewarding to get wise isn’t it? I bet you would love the book! I am so thankful that my parents instilled in me some great money mindsets. I’m still trying to figure out how they did that so I can pass it all on to my own kids. That is so great to hear!! I’m hoping I can do that for my kids! I think so! I really feel like more people are catching on! Excellent resources! Building a good perspective on money and it’s used it pivotal to building god management habits. So glad you see it that way! Great advice, waiting and saving for purchases can be tough but is better than charging and paying off for ages if you can avoid it. Great advice. I agree that dealing with your money the way the Lord would want you to is key to having a handle on your finances. What great ideas! I love seeing the different ways we can work to improve our situation. So important to remember these! So much great information in this post! I grew up in a divorced home so my mom worked a lot and we just didn’t have a lot of money. It was also one of those things we never talked about. I knew we didn’t have a lot so I didn’t ask for much, but when I got older and married, I didn’t exactly know how to discuss it with my husband. It’s been a learning process but I agree that you really have to change your mindset, otherwise you won’t be able to make any real, lasting changes. Absolutely! That would be tough to learn to manage! Your mindset can either make you rich or poor as a result of the ideas formed when you were young. When you break away from this habits and change the way you think, you open the door to abundance. Thanks for the list of resources on the web! Going to check out $5 meals. I need that too! Dave Ramsey’s Sinking Funds was a much needed idea in order to separate my money and avoid over-spending! I grew up poor and have struggled myself my whole life. I am changing that. Your post gave me a lot to think about. I’m pinning this so my fiancee and I can look at it together. I hope you can find ways to make it work for you!